Food security exists when all people, at all times, have physical and economic access to sufficient, safe and nutritious food that meets their dietary needs and food preferences for an active and healthy life. 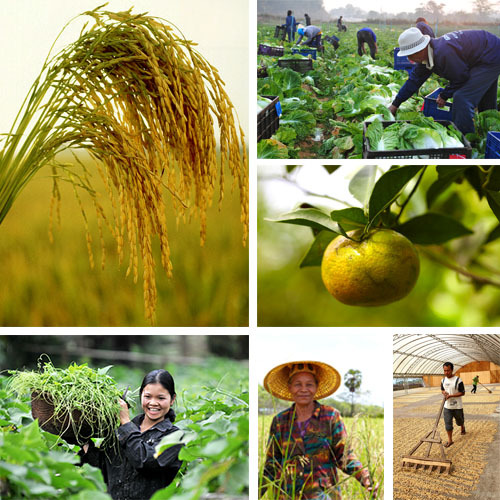 Agriculture is one of the main economic sectors in ASEAN. Food security in ASEAN requires national agrifood production systems that sustain the livelihoods and competitiveness of local agriculture and supply sufficient staple food throughout the region. Based on pilot measures, concepts are developed how farmers are best supported in the implementation of resource-saving and environmentally-friendly production technologies and practices. By this, the Project supports the realisation of ASEAN and the ASEAN Economic Community (AEC) by 2015 and beyond. Three crop sectors have been prioritized by ASEAN Member States, namely rice, fruits and vegetables. The project works at a regional level and has established six offices in the ASEAN region (Cambodia, Indonesia, Lao PDR, Myanmar, Thailand, Vietnam). ASEAN Member States are being supported through the provision of (inter)national expertise and the implementation of pilot projects. In addition, various public private partnerships accompany the project. Regional communication will be enhanced through the establishment of various platforms for political dialogue between public, private and civil society actors.